1. 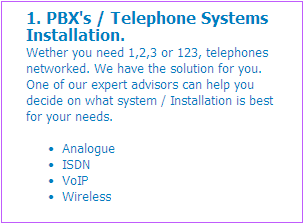 PBX's / Telephone Systems Installation. Wether you need 1,2,3 or 123, telephones networked. We have the solution for you. One of our expert advisors can help you decide on what system / Installation is best for your needs. Wether you need to network 2 or 102 Computers, wired or wireless. We have the solution for you. 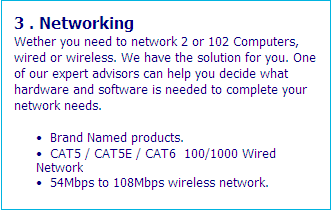 One of our expert advisors can help you decide what hardware and software is needed to complete your network needs. 54Mbps to 108Mbps wireless network. 2 . Computer Upgrades and Repairs. Wether you need to upgrade your Computer or if you need a NEW one. We have the solution for you. 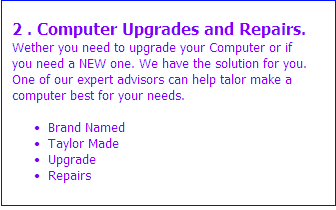 One of our expert advisors can help talor make a computer best for your needs.